Joshua Bruneau was born June 23,1988 in Waterbury Center, Vermont. While growing up, Josh was frequently found on the baseball field. After seeing a Time Life commercial, he was instantly drawn to classical music. Josh asked for classical tapes and records by composers like Bach, Mozart, and Chopin. His life took a dramatic turn when he was introduced to the trumpet and subsequently, jazz. Josh began to study the art of music and taking trumpet lessons when he 10 years old. These formative years proved very important as Josh discovered many recordings of musicians such as John Coltrane, Sonny Rollins, Dizzy Gillespie, and Charlie Parker. He immediately fell in love with these musicians and made a conscious decision to try to emulate these people’s playing. He started forming his own groups and playing locally from a young age. He was soon traveling with a local big band. He honed his skills all through high school at Harwood Union High School in Duxbury, Vermont. In the fall of 2006, Josh began his studies at the Jackie McLean Institute at the Hartt School. Josh was introduced to his two most important mentors, Nat Reeves and Steve Davis. He immediately started gigging around the Hartford area with local musicians and fellow students. Josh received the opportunity to travel to Ireland with Nat in his freshman year. Ever since, Josh has been playing with his instructors, Nat and Steve, on a regular basis. That same year he played with Nat, Steve, Eric McPherson, Alan Palmer, and Jovan Alexandre opening for Dionne Warwick. 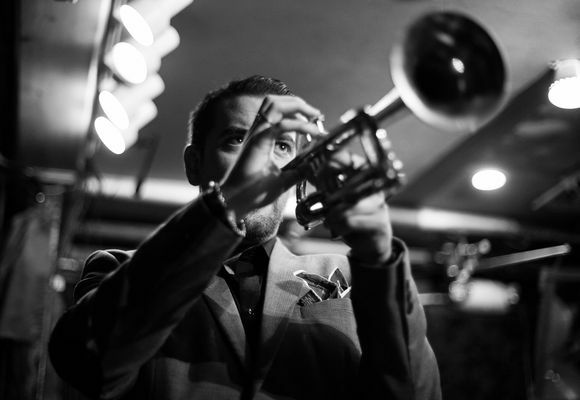 Because of his established relationship with his two mentors, Josh now frequents New York City to perform at world famous Jazz clubs such as Smoke and Smalls. September 2011 he played at the Detroit Jazz festival with another of his great mentors, Curtis Fuller. He has also shared the stage with artists such as Harold Mabern, Mike LeDonne, Eric Alexander, Joe Farnsworth, Carl Allen, John Webber, Ken Fowser, and Larry Willis to name a few. Now with the 2014 release of his debut album as a leader, Bright Idea (Cellar Live), Josh continues to look forward musically and push himself and his colleagues further.